Product prices and availability are accurate as of 2019-04-10 00:28:09 EDT and are subject to change. Any price and availability information displayed on http://www.amazon.com/ at the time of purchase will apply to the purchase of this product. 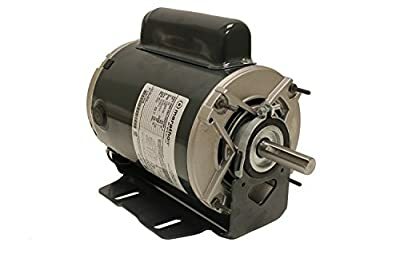 Marathon Fan and Blower Motor, Single Phase Split Phase, 3/4 HP, 1725 RPM, 115/208-230 Volts, 10.0/5.2-5.0 Amps, 56 Frame, Resilient Ring Mount, Open Drip Proof, Ball Bearing, Protection - Auto, C-Dimension - 10.72, 1.25 Service Factor, 5/8”Thru-bolts, shaft end.